Wireframing is one of the most important processes of UX Design. Clients need to understand each screen’s functionality before moving to the next step, that is designing. It is an opportunity for designers, developers, and stakeholders to input any changes (especially structural or functional). It helps in making the right decision for the product without being distracted by colors or styles. Creating wireframes can help in saving time and money, focus on the right functionality, get quick feedbacks from team members and stakeholders. To create wireframes for app or website there are a lot of online as well as desktop tools on the market. These tools can be helpful in bringing ideas to life. 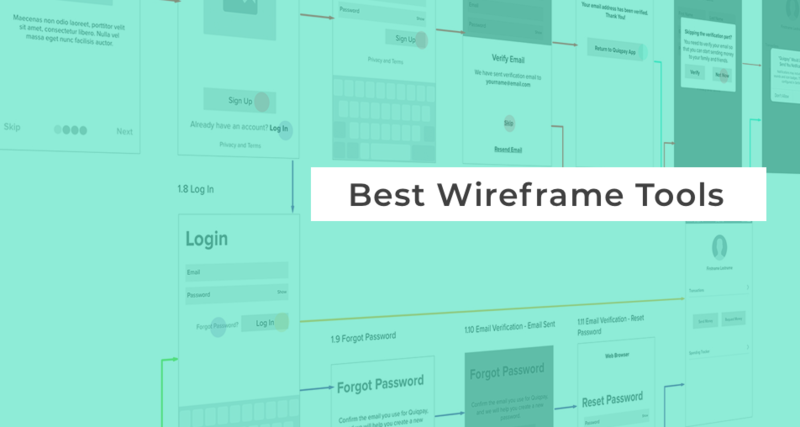 Below is the list of best wireframe tools in no particular order to consider for next web design or app design project. Balsamiq Wireframes is a small graphical tool to create wireframes. You can create user interfaces with drag and drop components. It has built-in UI controls, icons, and symbols. Balsamiq Wireframes gives you the opportunity to keep the mocks low fidelity or to create them to look like high fidelity mocks. It is a great tool with the ability to interact with team members and due to the “rough” look is a great way to focus on functionality and get as much feedback as possible from stakeholders and the team members. Balasamiq Wireframes is the best to create website wireframe or app wireframe. Axure is a great tool to create flowcharts, wireframes, mockups, user journeys, personas and idea boards. It is easy to create user interfaces by using drag and drop elements from their built-in libraries or you can create your own custom libraries. Axure lets you create rich prototypes with conditional logic, dynamic content, animations, math functions and data-driven interactions without writing any code. You can organize notes into separate fields for different teams members and stakeholders and convert them into HTML or Word doc (which will include screenshots). UXPin is a cloud-based tool where you can design and collaborate with your team members. You can create wireframes with built-in interactions, custom interactions, and animations. You can work on first creating wireframes and then directly work on building high-fidelity mockups or you can directly import as Sketch or Photoshop files for layered prototyping. It can be integrated with Slack, Jira and also Github. In their latest versions, they have added pen tool. You can dynamically update text elements and capture data from inputs or store user preferences to use later on your prototype. Another new feature added is a layer of logic for the prototypes. You can set rules that make the interaction happen only if those rules are met. A web app to help in creating and collaborating on wireframes, mockups, diagrams, and prototypes. It has drag and drop elements from their comprehensive library of widgets and smart-shapes. It has powerful, flexible, scalable page management system where you can create Master Pages, and apply and changes to all associated pages. This web tool is good to create wireframes for website and app. Moqups is now available for Jira and Confluence Cloud. Wireframe.cc is one of the free wireframe tools to create websites and app. It has a simple interface with a limited color palette and clutter-free environment to just focus on the functionality of the product. This tool is basic but gets the job done by not distracting the designers and the stakeholders. In Fluid UI, you can work on both high and low fidelity. It has its own set of widgets, shapes, icons for Material Design, iOS, Windows. Team members can collaborate real-time. Since it is cloud-based, you can access your project anywhere and you can share wireframes with stakeholders to get the right feedback. This wireframing tool is good to create an app. MockFlow is a collaborative digital whiteboard for brainstorming your products. It provides a full stack UX design solution including wireframes, sitemaps etc. The wireframes can be exported to a wide range of formats like PDF, HTML, PNG, DOC. MockFlow has thousands of wireframe templates to start your project. It has a great collaboration feature where team members can communicate an idea through real-time editing and adding comments. These tools are best to start a project from scratch and playing with ideas on paper and then refining them into your software. There are more tools available in the market to create wireframes, each having different functionality. Some tools also can be used to create prototypes whereas some tools are dedicated to creating wireframes. But remember, when creating wireframes for website or app, ALWAYS keep users in mind. First, create personas through user research and then start working on wireframes. UX plays an important factor and it defines how a product will look and feel.